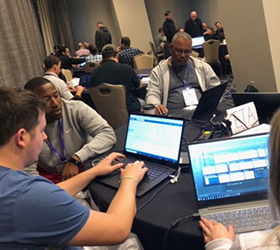 Last week, two programmers from Core Associates attended the Acumatica Summit 2019 in Houston to compete in a Hackathon. 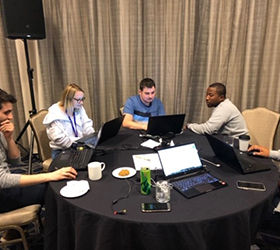 This event was an opportunity for ISV (independent software vendor) developers to showcase their wits and compete against one another. We are proud to report that our AcumatiScan crew was on the 1st place team! The assignment was to design a solution that could be used with Acumatica. There were approximately 10 teams of 6-7 members each; one member on each team was an Acumatica employee while the others were from ISVs. Each team had 24 hours to execute the task, including polishing their product for a formal presentation to be judged. 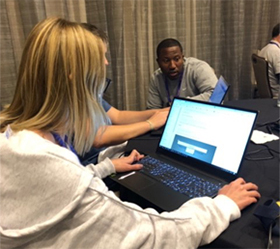 Team Eta, the winning team containing AcumatiScan programmers, developed a software solution that improved the onboarding, and overall training, experience that tracks the progress/status of Acumatica University students in their online certification training. Please join us in congratulating Laura and Michal in this prestigious accomplishment!